Aquaman has been absolutely tearing it up at the box office since it was initially released overseas last month. This was very much the success that DC needed. 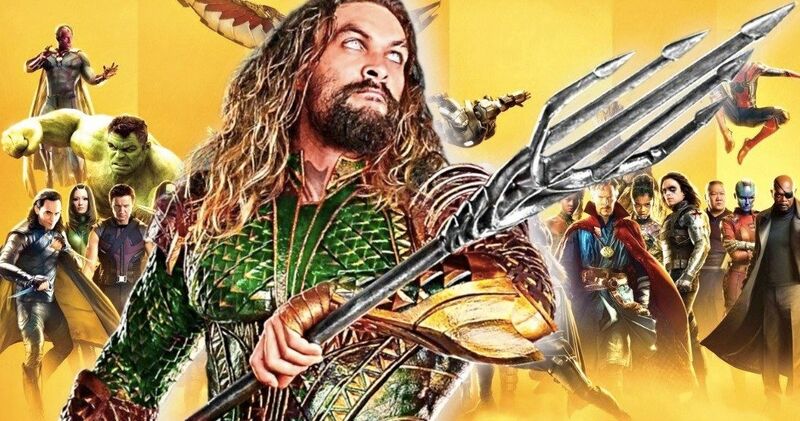 While it may be shocking that a movie about a character who has been ridiculed in pop culture mercilessly for years is going to wind up making a heck of a lot more than the last Superman movie did at the box office, it might also come as a surprise to learn how many Marvel Cinematic Universe movies Aquaman has already surpassed. We don’t have the most up to date figures for the movie’s current overseas box office grosses, but with the additional $10.1 million that director James Wan’s Aquaman pulled in on New Year’s Eve, its domestic total stands at $199.5 million, to go along with its already massive $562.4 million international haul. That gives us a total of at least $761.9 million. And that is better than ten of the 20 movies that make up the MCU, which kicked off with Iron Man back in 2008. Over the last decade, Marvel Studios has become the gold standard for superhero movies, but with Aquaman, the tides may be turning a bit. That $761.9 million figure, which will grow quite a bit in the coming days, already puts Aquaman ahead of Captain America: The Winter Soldier ($714.3 million), Doctor Strange ($677.7 million), Thor: The Dark World ($644.6 million), Iron Man 2 ($623.9 million), last year’s Ant-Man and the Wasp ($622.7 million) and the movie that started it all, Iron Man ($585.2 million). Below that mark we get to some of the slightly less impressive earners in the MCU, such as Ant-Man ($519.3 million), Thor ($449.3 million), Captain America: The First Avenger ($370.6 million) and The Incredible Hulk ($263.4 million). Point being, Aquaman has already overtaken every single one of those Marvel entries and, probably by the time I finish writing this sentence, it will have also passed the original Guardians of the Galaxy, which grossed $773.3 million and was seen as a huge success at the time, surpassing expectations. Needless to say, Aquaman has also already exceeded expectations. If the trend continues, Jason Momoa’s first solo outing as Arthur Curry could wind up crossing the $1 billion mark before its run wraps up. If not, it’s going to get very close. That means it could still overtake the likes of Thor: Ragnarok ($854 million), Guardians of the Galaxy Vol. 2 ($863.8 million) and Spider-Man: Homecoming ($880.2 million). But really, this shouldn’t be about Marvel vs. DC. This proves that audiences are just as hungry as ever, if not hungrier, for good comic book movies, regardless of what publisher the character originated with. This superhero movie bubble is nowhere near ready to pop, or so it would seem. This is good for everyone. For Warner Bros., this is the saving grace they were hoping for following the lackluster response to Justice League, both critically and at the box office. One thing worth pointing out is that Aquaman, which currently sits at a 64 percent approval rating on Rotten Tomatoes, is still a bit further down the critical totem pole than a lot of the MCU movies that it’s outgrossed, but it’s certainly a massive step in the right direction. Then Again if Venom, $855 million later, taught us anything, it’s that critics and moviegoers sometimes just don’t see eye to eye. In any event, Aquaman is a certifiable hit and it may well (finally) be DC’s time to shine. These numbers were provided by Box Office Mojo.